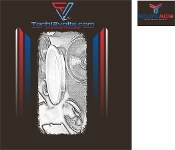 TECH12volts.com tshirt logo above will be on back . aND TAYLORS AUDIO ON FRONT We will ship USPS priority. Sizes Adult small to 3XL.